Communique Reservationless conferencing service offers the convenience of an automated conference call without having to make a reservation. A simple, one-time activation is all it takes to set up your virtual conference call room. Conduct reliable, secure, and clear sounding conference calls instantly 24 hours a day, 7 days a week, whenever you need to conduct your meetings. Our service utilizes Dolby Voice® technology to deliver exceptional voice clarity and detail while suppressing distracting background noise. 24/7/365 Live Support: Eight global operations centers are staffed to provide local customer support to leaders and attendees before, during or after your call. Most Reliable: Redundant conference call facilities are distributed worldwide throughout seven (7) cities in the United States, three (3) cities in Canada, and six (6) cities international. Web Controls: Start and manage your conference call online. Mute and unmute all or specific participants; Drop a caller; Lock the call to prevent more participants from joining; Record the call and more. Custom Branding: We can private brand your reservationless conference call greeting to promote your company and build your brand as attendees join your calls. Click here to listen to a sample branded reservationless call prompt. 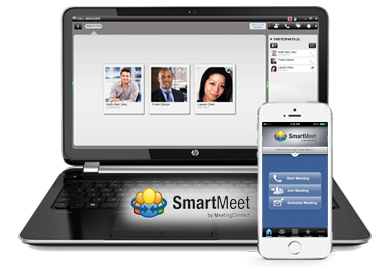 View and control your conference calls from your computer or smart phone using our free Call Manager tool. Our easy-to-use interface takes the guess work out of conference calling. Want a simpler way to connect to meetings when you’re on the go? Or do you need an easier way to organize the dial-in numbers and passcodes for several different meetings? MeetingConnect Mobile Assistant, a free service, gives you one-touch dialing into your conferences from your mobile phone. Store up to 256 unique sets of audio conference details from weekly, recurring meetings to one time calls you need to attend while mobile. Start and join audio conferences with the push of a single button. You no longer need to enter your ten-digit dial-in number, conference code and leader PIN. Join audio conferences as a participant or a leader. You indicate the details when creating your profile. Press *2 to record a meeting or with one click using the online web interface. Maintain total conference call control right from your computer with active talker, mute/unmute, dial out to add participants, break out room control and chat. 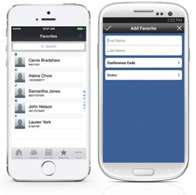 Host or join conference calls from iPhone, Android or Blackberry device with a single touch or a click. Communique audio conferencing comes with 24/7/365 *0 operator support across the globe. To easily manage your reservationless conference call account. Add, modify and remove users instantly. View and pay your bill online. One-click conference call scheduling via Microsoft® Outlook. Track calls by cost center, department or location. Account code reporting will appear on your monthly invoice. Our reservationless service enables you to conduct conference calls anytime with up to 300 callers. No need for a reservation. Ensure your meetings are secure with security passcode, lock/unlock, roll call, and entrance/exit options. Experience matters. Communique is the worldwide conference call service leader. With 99.99% up time and 24/7/365 operator support, you can rely on Communique to for crystal clear sounding calls. For 16 years, Communique has been delivering reliable conferencing services to business, non-profit and government clients. Over 34,000 uses in over 34 countries trust Communique for their important conversations. Give us a call or click the “hello” icon below to send your request online. We're here to help. Call and speak to a Communiqué Conferencing expert to answer any questions you have. Read about Communiqué Conferencing Operator Assisted Conference Calling Service. Give our service a try by signing up for a 14-day no obligation trial. No credit card necessary. Updated May 23, 2018: Your privacy is an important factor Communique considers in the development of each of our products and services. This Privacy Statement explains generally how we receive personal information about you, and what we do with that personal information once we have it. If you are completing a sales contact form on our website, we use the personal information collected from you in order to respond to your inquiry. Such personal information that we collect is not used for any other purpose and is NOT shared. We do NOT partner with or have special relationships with ANY ad server or marketing companies. For us, “personal information” means information which identifies you or allows us to contact you, like your name or email address. How do we learn personal information about you? when we try to understand more about you based on personal information you’ve given to us (e.g., when we use your IP address to customize language for some of our services). What do we do with your personal information once we have it? When you give us personal information, we will use it in the ways for which you’ve given us permission, or ways in which our clients who provided us the personal information instruct. Generally, we use your personal information to help us provide and improve our products and services for you and our clients with which you have a business relationship. We may also use the personal information you provide to contact you regarding additional or new services and features offered by Communique, or important information regarding Communique. If you have provided personal information to our client, their privacy statement will also apply. You should familiarize yourself with their statement. When we’re required to provide it to our client from whom we received your personal information, or with whom you have a business relationship. For processing or providing products and services to you, but only if those entities receiving your personal information are contractually obligated to handle the data in ways approved by Communique. We sometimes provide personal information to our business partners to make our products and services better, but when we do so, we will remove your personal information and try to disclose it in a way that minimizes the risk of you being re-identified. We follow the law whenever we receive requests about you from a government entity, or related to a lawsuit. We’ll notify you or our client from whom we received your personal information when we’re asked to hand over your personal information in this way unless we’re legally prohibited from doing so. When we receive requests like this, we’ll only release your personal information if we have a good faith belief the law requires us to do so. Nothing in this Statement is intended to limit any legal defenses or objections you may have to a third party’s request to disclose your personal information. We share your personal information if we have a good faith belief it is reasonably necessary to protect the rights, property or safety of you, our other users, Communique or the public. If our organizational structure or status changes (e.g., if we undergo a restructuring, are acquired, or go bankrupt), we may pass your personal information to a successor or affiliate. We are committed to protecting your personal information once we have it. We implement physical, administrative and technical security measures. If, despite these efforts, we learn of a security breach involving your personal information, when required by law, we’ll notify you or our client so appropriate protective steps can be taken. Communique is not responsible for unauthorized access to such personal information by hackers or others that obtain access through illegal measures in the absence of negligence on the part of Communique. We’re a global organization and our information systems are in several countries around the world. We also use service providers whose information systems may also be in various countries. This means your personal information might end up in one of those information systems in another country, and that country may have a different level of data protection regulation than yours. By giving us personal information, you consent to this kind of transfer of your personal information. No matter what country your personal information is in, we comply with applicable law and will also abide by the commitments we make in this Privacy Statement. If you are under 13, we don’t want your personal information, and you must not provide it to us. If you are a parent and believe your child who is under 13 has provided us with personal information, please contact us to have your child’s information removed. You may have access to other sites through the Communique websites. These sites may have different security practices and you should familiarize yourself with those practices. Communique does not track the non-Communique website activity of any internet user with Do Not Track browser settings engaged. What if we change this Privacy Statement or any of our privacy notices? We may need to change this Statement and our notices. The updates will be posted online. If the changes are substantive, we will announce the update through Communique’s websites. Your continued use of the product or service after the effective date of such changes constitutes your acceptance of such changes. To make your review more convenient, we will post an effective date at the top of the page. Or, you may email us at info@communiqueconferencing.com. Please complete the form below to receive WebEx pricing and information based on the use case indicated below. Please complete the form below if you have questions, would like to arrange a live demo, or purchase. A product expert (we call them Customer Fanatics) will respond within six business hours.